Hong Kong: Photographic accessory manufacturer Pixel Enterprise have unveiled a new generation of flash triggers. 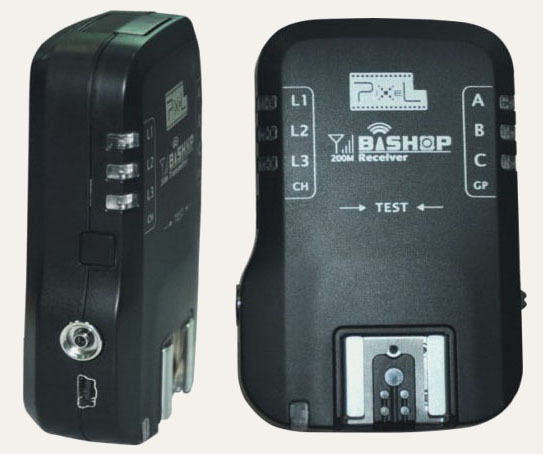 The Pixel King and Bishop build on the features of the existing Knight and Soldier transceivers by adding hotshoes to the transmitters, meaning that – like the Phottix Strato – you will be able to use an on-camera speedlight and off-camera flashes simultaneously. Wireless Flash Grouping features in both units. With a Knight, Pawn, Soldier, King and Bishop all under their belt, how long until Pixel run out of chess pieces? 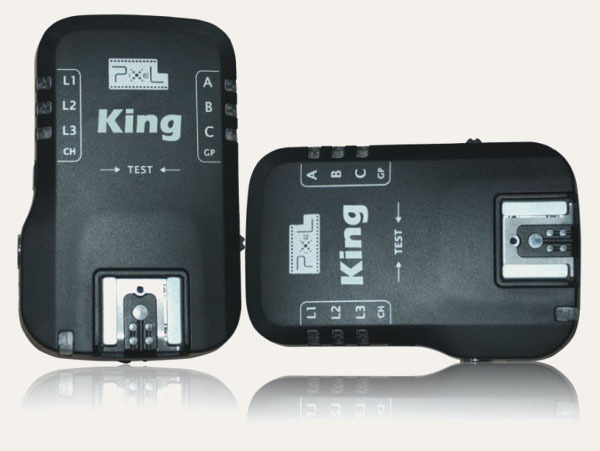 So far it appears that the working basis for the Pixel King is a “wireless TTL cord”, just like its predecessor the Pixel Knight (TR-33X). Therefore the capabilities are limited to those of the equivalent Nikon or Canon TTL cables. For Nikon users this means that the only adjustments you can make from the camera are global ones (e.g. flash exposure compensation) and any manual adjustments need to be made at the flash. Canon users lucky enough to own an EXII series flash will be able to control both TTL and manual functions via their camera menus. Wireless Flash Grouping adds the ability to selectively trigger (or not) the flashes in your setup. The hotshoe on the transmitter will allow you to mount an infrared commander (e.g. SU-800, ST-E2) and use Canon or Nikon’s own wireless systems in parallel. You may also attach any regular speedlight for fill, bounce or autofocus assistance. The Bishop seems simply to be an updated Soldier (TF-37X) with the benefit of USB firmware updates and a TTL pass-through hotshoe on the transmitter. The latter, when combined with a wireless flash commander (e.g. SU-800, ST-E2) will allow you to simultaneously trigger manual flashes (via radio) and TTL flashes (via infrared) without the need for pesky PC cables. Canon users will also appreciate the ability to mount a Speedlite or ST-E2 for use as an autofocus assist lamp. The Pixel King and Bishop will be available from the official Pixel Enterprise eBay store “maybe in the next month”. The price is to be announced. For more information, please visit the Pixel King and Pixel Bishop product pages.